Managing field employees and their tasks have always been a challenge for any organization. The reporting authority at the office has to assign the tasks to their field employees and track their status. Tasks such as cold calls, support calls, meetings, etc. carried on field visits are required to be scheduled and accomplished on time. Furthermore, status of the tasks needs to be updated as well. Any deviation in the accomplishment must be highlighted to the concern person. COSEC Field Visit Management is a convenient tool to manage field employees from a centralized location. The software provides live tracking of field employee schedules via reports with real-time notifications on exceptions. 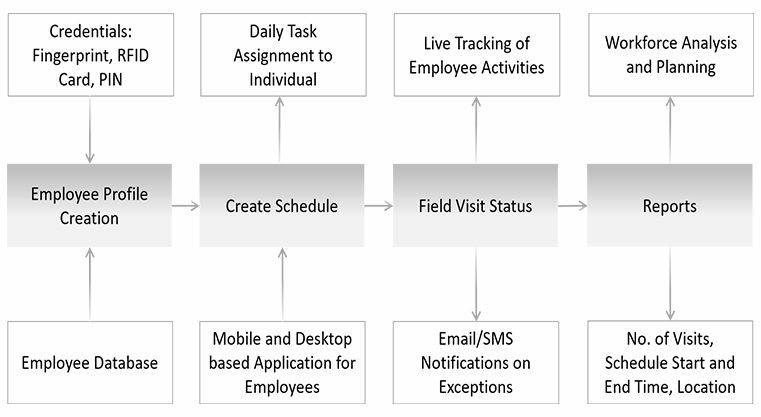 Admin may set day-to-day work schedules and track the movement of field employees.